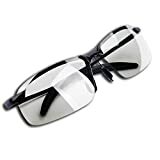 #ad The YIMI Polarized Sports Driving Day and Night Sunglasses lenses automatically sense the intensity of light changes and absorb the ultraviolet rays, the stronger the light, the darker the color of the lens is. Buy for $21.89 and get FREE shipping at Amazon.com. They effectively filter the strong light, strengthen the visual definition, reduce eye fatigue, keep the eyes always the most comfortable state.